In June 2004, after years of constant overwork, Ian finally had a little free time, and at the same time Tom was on vacation with nothing to do but sit in front of the TV. There was only one thing for it: Road Trip!!! In seven years in Santa Cruz, this road trip was the first. There had been a couple of trips to and from tourist attractions in California (such as Yosemite and Disneyland), but no real driving for the sake of it, no driving even to another State, not even when we had Edgar. Somewhat arbitrarily, which is the essence of a good road trip, we headed to Colorado, a 2500 mile round trip which we covered in 6 days, including one day for recreation. The map above shows the entire trip with where we moteled each night. The longest day's drive was from west of Grand Junction in Colorado all the way across Utah and over half the way across Nevada to Tonopah. We didn't plan it that way, but there was nothing at all in the way of accommodation between Ely and Tonopah, notwithstanding the several towns named on the map. In fact, in each case there was no town there! It being a true road trip, we screwed up at least some of the photos (by double exposing them), and so cannot show the pictures that we took of these sad and almost non-existent towns, with their abandoned gas stations and cafes. The frontier is still there, just back inland nowadays. The trip had two destinations. One was Crystal, a ghost town in the mountains that thrived a hundred years ago when silver mining made economic sense in Colorado, and the other Durango, another town built on mining, but one which has survived by being in the valley on major routes and knowing how to attract tourists. 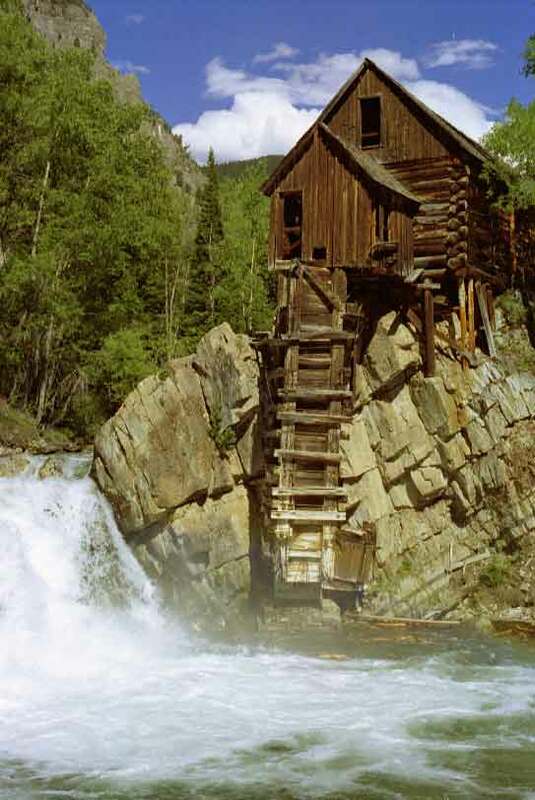 The large photo on the left is of the mill at Crystal, which we reached courtesy of a four-wheel drive service in nearby Marble. The last five miles of the trip took over an hour, over a narrow and rocky mountain path! But was it worth it?! On the right, the first cabin on Crystal's Main (and only remaining) Street, with Pat Gray. Her mother, Fogle Neal, first showed Ian her beloved Crystal in around 1972. This was during Ian's early travels around North America, complete with backpack, pony tail and (sometimes) a pink '59 Chevy Impala Coupe. The car wasn't on that trip, though. 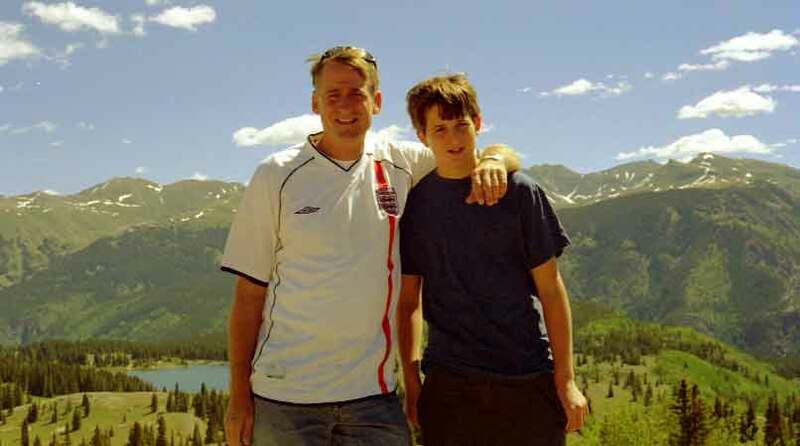 Fogle picked Ian up hitch-hiking outside Aspen, and brought him up the four-wheel drive road to Crystal. She was obliged to use the winch mounted on the front of her Jeep repeatedly to dislodge big rocks that had fallen on to the narrow road from the mountainside above. Ian should have stayed longer than one night, but the next morning right after he woke up another four-wheel drive vehicle came through, this one with two students in it. They were heading up the pass to Crested Butte, and in Ian jumped. Could have stayed longer. . . 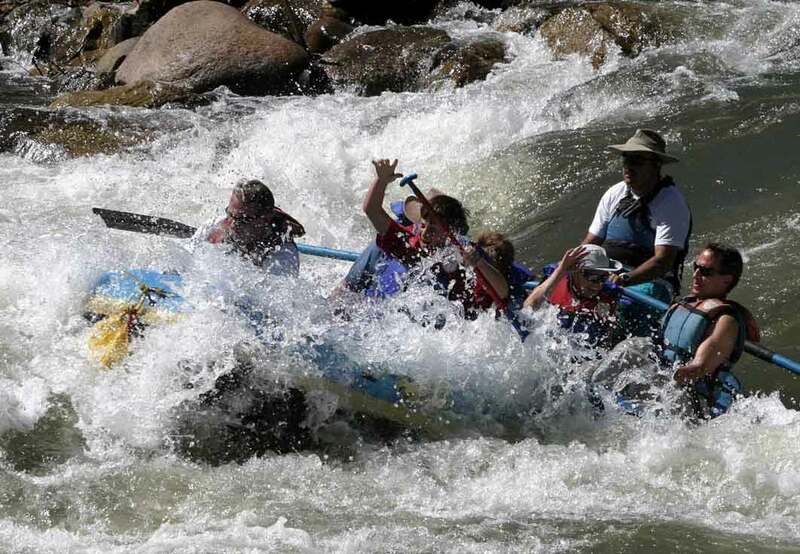 Here is the high spot of the Durango part of the trip, a short afternoon's rafting on the Animas River. Ian is front left, and Tom front right. Casey, the owner/guide, offered Tom a job when he comes of age because Tom was paddling with such vigor all the way. 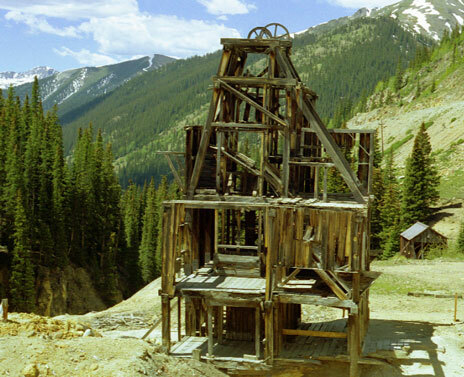 Tom took this one of an abandoned mine between Silverton and Ouray, just off one of the most beautiful mountain roads in the US. By the side of the road on the Arizona New Mexico border. 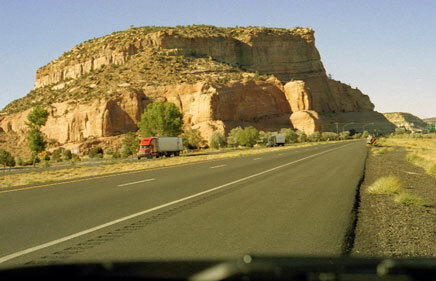 The road is Interstate 40, which tracks US Route 66, the one that they used to call America's Main Street, throughout the Southwest. The trucks never stop coming in this part of the world. And neither do the trains! 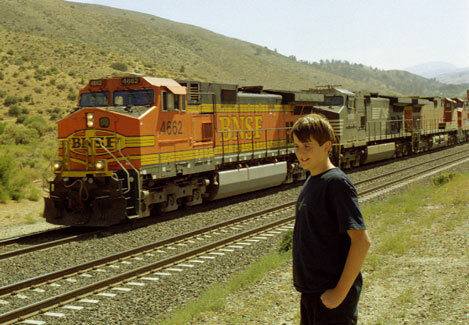 Here is Tom next to a BNSF freight East of Bakersfield. Burlington Northern Santa Fe: it sounds like a history lesson. The line follows the Interstate, the old Route 66, more or less, and the freights never seem to stop. Tom's hobby on this trip was placing pennies on the line before the train came, and then trying to recover them after the train had flattened them. Not coincidentally, we saw more than our fair share of trains during this trip. 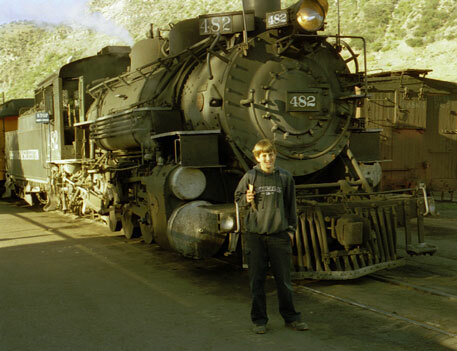 Behind Tom here is the locomotive that pulled our tourist train up the Animas River canyon from Durango to Silverton. 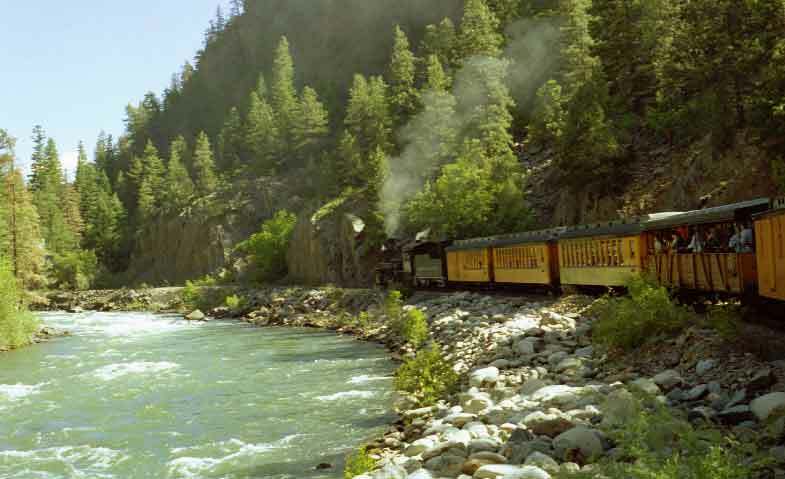 The line was originally built to serve the miners of Colorado, but was bought by insightful business people who saw the attraction of a beautiful railway line in the mountains where the road can't go. And here is that beautiful railroad line, formerly a piece of the Denver & Rio Grande. This was taken from one of the rear carriages. Finally, here we are, with Tom looking a little uncomfortable with his dad's arm around him, on the highway between Durango and Silverton. Ian had always wanted to visit that beautiful State again, and that little ghost town Crystal again. Places where he travelled back when he was a hippy traveler stayed with him. 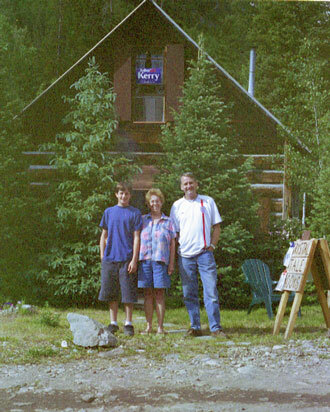 The family had crossed Colorado during their Amtrak trip from New York to Oakland in 1997. But the stop in Denver had lasted a meager two hours. He doesn't entirely remember how he ended up in Durango back in 1972 or thereabouts: the seventies were often like that! But he was there at a time when he could not afford to take the Silverton train. Now that he could afford to take it, he wanted to. Plus, he had left the pink 1959 Chevy with some people there and never found the time to go back and get it. Of course, he didn't expect to find it still there in 2004!  But it was a place where there was unfinished business. That's what a road trip is for, the spaces in life where the reasons are not entirely rational and you can just let yourself go.